This February, the fight for gay and lesbian marriage in Washington state is finally moving toward a successful legislative conclusion — some four decades after two men, Faygele benMiriam and Paul Barwick, went to the court house in King County to demand a license. They were, of course, denied. The two later filed a lawsuit that made its way to the Washington State Court of Appeals which ruled that marriage was between a man and a woman only. What’s fascinating, of course, is that both men worked more from a fraternal understanding of how extended and innovative gay relationships could be constructed rather than a romantic mindset. Neither especially believed in that triple supremacy of romantic, heterosexual monogamy — but they did believe queers everywhere had a right to claim whatever type of relationship they wanted. 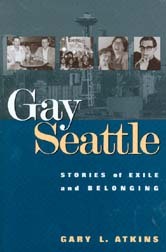 Theirs is one of the many stories you can read in Gay Seattle: Stories of Exile and Belonging. For the present, the accolades go to those legislators, especially state Senator Ed Murray, who patiently worked through years of objections with a step-by-step approach: a judicial challenge to the states Defense of Marriage Act (sorry to say the judges had not enough courage to strike down the law); a domestic partnership law; an “everything but the marriage word” domestic partnership upgrade; and finally gubernatorial support and legislative success. A new story for another edition of Gay Seattle! For an update on current relations between the Seattle Catholic Archdiocese and the local LGBTQ community, following the recognition by Washington state of marriage equality, see “Mass Uprising” by Dominic Holden in The Stranger.